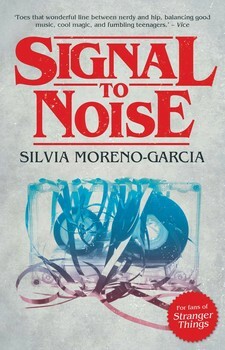 Signal to Noise is an all-to-realistic piece of magical realism. It took me quite awhile to actually get to starting this book, languishing on my to-read list for over a year. So I made a deliberate choice to include it as a book club pick and read it, hence it's place as my February read. While the book gives a coming-of-age magical realism front, the story eschews many of the all-to-common patterns. Moreno-Garcia's prose possesses a rich lyricism that fits well in a story so filled with music. The story has its bright spots, but much of it is harsh and scrabbling, a story of friends struggling to overcome the hands they were dealt, a story of consequences, and a story of resentment. For all of that, the story is beautifully told, but one that I personally felt reluctant to read at times, a result of seeking extra escapism in reading than normal as of late. From Wikipedia: "Signal-to-noise ratio is a measure used in science and engineering that compares the level of a desired signal to the level of background noise. It is defined as the ratio of signal power to the noise power, often expressed in decibels." What is the nature of magic? How does it connect to the different characters? What about their different objects of power? Meche says "Why shouldn't music have power? My dad say it's the most powerful thing in the world. Nietzsche says that without music, life would be a mistake." What are the different roles of music, and it's power, that manifest throughout the book? At it's core, Signal to Noise can be considered a love story (though not specifically one of romantic love). How do the different relationships and loves morph throughout? Does the story have a hero? Does it have a villain? We're warned early on that "magic will break your heart." In what ways does this come true?